The domestic league programme gave way to the first rounds of the respective O’Neill’s Ulster Cup competitions at the weekend with local clubs emerging with pride intact after a decent showing. Drummond’s decision not to enter the tournament given that the rest of the rounds are scheduled for Sundays meant that only seven North West sides took part in Saturday’s Ulster Cup, with four making it through to the next stage. Bready’s win over Lisburn and Strabane’s victory at home to Carrickfergus were probably the most noteworthy courtesy of their shaky starts to the summer, however Brigade and Ardmore also posted huge wins on the road to Instonians and Derriaghy respectively. Donemana were comfortably beaten at home by CSNI while Coleraine went out as well following defeat away at Irish Senior Cup holders Waringstown. Eglinton were on the receiving end of a real thumping from Marty Moreland’s North Down. It was the turn of the Championship teams on Sunday however several matches were decided by either bowl-out or concession without a ball bowled. Struggling St Johnston were unable to muster a side to go to Downpatrick, while Newbuildings lost a remote bowl-out against Bangor 2-1. Fox Lodge enjoyed better fortune as Marco Marais was the only player of 10 to hit the sticks; the Foxies going through to the quarter finals on a 1-0 verdict against Academy. 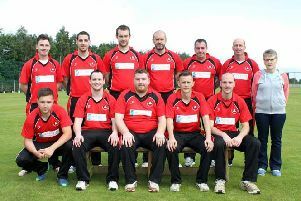 Glendermott won a bowl-out too; Dean Curry and Trevor McDermott on target for them as they drew 2-2 with Saintfield before Curry struck a second time in sudden death to seal a 3-2 win. Killyclooney lost out too- a 2-1 reverse for them having travelled all the way to Armagh. Bonds Glen are out after a 2-1 defeat at home to Templepatrick while Burndennett and Ballyspallen were both beaten in more conventional fashion. ‘Spallen managed just 102 all out and although they battled hard to pick up 5 wickets- they just hadn’t enough runs to play with. It was a similar story at Burndennett where the home side made 162; however visitors Woodvale did enough to see out a 4-wicket win. There was just a single league game on Sunday- Ardmore’s determination and patience paying off as they won a final-ball thriller at home to Drummond.